10,000 Maniacs is an American alternative rock band that was founded in 1981. They have released nine studio albums, six EPs and five live albums. They achieved their most significant success between 1987 and 1993, when they released four albums that charted in the top 50 in the US: In My Tribe (1987), Blind Man's Zoo (1989), Our Time in Eden (1992) and the live album MTV Unplugged (1993). After the recording but before the release of MTV Unplugged, original lead singer and main songwriter Natalie Merchant left the band to pursue a solo career. She was replaced by Mary Ramsey, who was the lead singer from 1993 to 2001 and then from 2007 to the present. The band was formed as Still Life in 1981 in Jamestown, New York, by Dennis Drew (keyboards), Steven Gustafson (bass), Chet Cardinale (drums), Robert Buck (guitar and Newhouse's ex-husband) and Teri Newhouse (vocalist and Buck's ex-wife). Gustafson invited Natalie Merchant, who was 17 at the time, to do some vocals. John Lombardo, who was in a band called The Mills (along with brother guitarist/vocalists Mark Liuzzo and Paul Liuzzo and drummer Mike Young) and used to play occasionally with Still Life, was invited to join permanently on guitar and vocals. Newhouse and Cardinale left the band in July, and Merchant became the main singer. Various drummers came and left. The band changed its name to Burn Victims and then to 10,000 Maniacs after the low-budget horror movie Two Thousand Maniacs!. They performed as 10,000 Maniacs for the first time on Labor Day, September 7, 1981, with a line-up of Merchant, Lombardo, Buck, Drew, Gustafson, and Tim Edborg on drums. Edborg left and Bob "Bob O Matic" Wachter was on drums for most of the 1981 gigs. Tired of playing cover songs—though their first notable American hit was a cover of the Cat Stevens hit "Peace Train"—the band started to write their own music, usually with Merchant handling the lyrics and Lombardo the music. In March 1982, with Jim Foti on drums, the band recorded an EP album called Human Conflict Number Five. More gigs followed in 1982. During this time they lived in Atlanta, Georgia for a short while at the encouragement of friends who said that many gigs were available there. Discouraged by the lack of actual gigs, and by having to sell plasma and rake leaves to buy food, the band moved back to Jamestown in November 1982 to regroup. At the beginning of 1983, Jerry Augustyniak joined the band as their permanent drummer. The Maniacs met Augustyniak when they played in Buffalo, New York, where he was in a punk band called The Stains. Between March and July, the band recorded songs for a second record, Secrets of the I Ching, their debut full-length album, which was pressed by Mark Records for the band's own label Christian Burial Music. The record was well received by critics and caught the attention of respected BBC Radio 1 DJ John Peel in London. One song, "My Mother the War", turned out to be a minor hit in the United Kingdom, and entered the independent singles chart. The band toured extensively during 1983 and 1984, and played gigs in the UK. Co-founder Lombardo left 10,000 Maniacs during a rehearsal on July 14, 1986. The remaining five members started recording a new album in Los Angeles with Peter Asher as the producer. In My Tribe, a more pop-rock oriented record, was released on July 7, 1987. The album stayed on the charts for 77 weeks, peaking at No. 37, and established a large U.S. audience for the group. It was also well received in the UK. The album originally contained "Peace Train". It was removed from subsequent pressings after Cat Stevens (now Yusuf Islam) made comments implying he agreed with a death Fatwa against author Salman Rushdie. 10,000 Maniacs' next album, 1989's Blind Man's Zoo, hit No. 13 and went gold, further increasing the group's following. In May 1989, the British music magazine NME reported that 10,000 Maniacs had won the songwriter category prize at the New York Music Awards. In 1990, with the help of Lombardo, they remastered their first two records, Human Conflict Number Five and Secrets of the I Ching, and released them as a compilation called Hope Chest: The Fredonia Recordings 1982-1983. Lombardo and Mary Ramsey, who had formed a folk act called John & Mary, opened gigs for the Maniacs on the Hope Chest Tour in 1990. 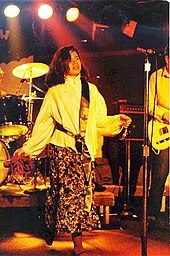 In 1991, during the recordings of a new album, Merchant revealed to the other members that she would be leaving 10,000 Maniacs for a solo career in two years' time. The new album, Our Time in Eden, was released on September 29, 1992. In 1993, the band performed at the MTV Inaugural Ball for President Clinton in January and on MTV Unplugged on April 21. Merchant announced her departure from the band on MTV on August 5, 1993, saying she "didn't want art by committee anymore." The MTV Unplugged album was released on October 26, 1993. "The last 10,000 Maniacs gig was the first time I'd got drunk in nearly two years," Merchant later recalled. "I laughed a lot and threw lots of flowers out of the hotel window." In late 1993/early 1994, the remaining members of 10,000 Maniacs (Augustyniak, Buck, Drew and Gustafson) asked John & Mary to join the band and continue. The revamped band began performing new material almost immediately, initially calling themselves "John & Mary, Rob, Steve, Dennis, & Jerry," before they were able to legally regain control of the 10,000 Maniacs name. 10,000 Maniacs released two albums with Ramsey on vocals. In 1997, they released Love Among the Ruins on Geffen Records, from which their cover of the Roxy Music song "More than This" became a moderate hit, and followed up in 1999, with The Earth Pressed Flat on Bar/None. In December 1998, Buck took some time off from the band, moving to Texas to focus on a new project called League of Blind Women. The band recruited Buffalo-based Michael Lee Jackson of the band Animal Planet to step into the lead guitar role. Buck returned to the band in the summer of 1999. On November 3, 2000, 10,000 Maniacs played with the Buffalo Philharmonic Orchestra, in Buffalo, New York. It was the last concert they performed with Buck. On December 19, 2000, Buck died of liver failure at the age of 42. He was buried in the Mission Covenant Church Cemetery in Sugar Grove, Pennsylvania. Following Buck's death, 10,000 Maniacs took a break. Gustafson and Drew, with Jeff Erickson, started a band called The Mighty Wallop!. Augustyniak joined a band called Only Humen. On December 5, 2001, a 10,000 Maniacs line-up comprising Gustafson, Drew, Augustyniak, Lombardo and Ramsey played on a benefit concert in Toronto, with Buck's former guitar technician, Erickson, on lead guitar. In 2002, Gustafson, Drew, and Augustyniak decided that they wished to continue 10,000 Maniacs with a new lead singer. Lombardo showed up at the first band practice, found out that the band had hired Erickson to play lead guitar and Oskar Saville of the Chicago-based band Rubygrass to sing, and quit the band. This lineup toured sporadically between 2002 and 2006, playing at various festivals. On January 27, 2004, Elektra/Asylum/Rhino Records released Campfire Songs: The Popular, Obscure and Unknown Recordings, a two-CD set compilation, with 31 digitally remastered songs, four of them demos and one unreleased. The second disc contained B-sides and outtakes throughout the band's career up to that point, including many covers. Jackson Browne's "These Days" and Tom Waits' "I Hope That I Don't Fall in Love with You" were among those included. In 2006, John & Mary formed a folk-rock band called the Valkyries. John & Mary & the Valkyries are composed of several longtime Buffalo music scene stalwarts. Ramsey rejoined the current edition of the band for several dates in 2006, playing viola and singing backing vocals. Saville left in 2007, and Ramsey regained the lead vocalist spot. The current edition of 10,000 Maniacs (Augustyniak, Drew, Erickson, Gustafson and Ramsey) remains active, playing shows throughout the United States, focusing on, but not limited to, the east coast. In June 2011, the band released the EP Triangles on their own label, Ruby Wristwatch Records. The band celebrated its 30th anniversary in October 2011 with two sold out concerts at the Scharmann Theater on the campus of Jamestown Community College. The band spent most of 2012 recording a new full-length album at their studio in Jamestown, New York. In February 2013, they released the album, entitled Music from the Motion Picture. Former drummer Robert Wachter died on March 26, 2013, at the age of 49 due to a long illness. Twice Told Tales, an album of traditional British Isles covers, was released on April 28, 2015, on Cleopatra Records. Founding member John Lombardo was brought back into the fold as creative director and to play guitar on the album and following tour. 10,000 Maniacs released their live album Playing Favorites on June 3, 2016, their first live album with Mary Ramsey on lead vocals. 2000 "(I'm Always Touched by Your) Presence, Dear" Digital download provided through Reciprocal for $1.50. Studio cover version of a Blondie song from around 1995. 2000 "Rainy Day (live)" Digital download provided through Reciprocal for $1.50. Live acoustic performance from Fredonia Opera House in 1998. 2000 "Stockton Gala Days (live)" Digital download provided through Reciprocal for $1.50. Live acoustic performance from Fredonia Opera House in 1998. 2013 "Sweetest Gift" Digital download provided through PledgeMusic to those who supported the pledge for Music from the Motion Picture. The song was recorded for the album but was not included. 2015 Twice Told Tales Alt/Early Mixes/Takes Digital download provided through PledgeMusic during the drive to support Twice Told Tales exclusively available in the producer package. All songs from the original album except for "Lady Mary Ramsey", "The Song of Wandering Aengus", "Bonny May", "Greenwood Sidey", and "Lady Mary Ramsay II." 1985 The Tube 10,000 Maniacs Performed "Can't Ignore the Train" and "My Mother the War"
1985 Music Convoy 10,000 Maniacs Mimed "Grey Victory"
1987 The Tonight Show Starring Johnny Carson 10,000 Maniacs Performed "Peace Train" and "Don't Talk"
1988 Saturday Night Live 10,000 Maniacs Aired 27 February 1988; performed "Peace Train" and "Like The Weather"
1988 The White Room 10,000 Maniacs Performed "Don't Talk" and "Like the Weather"
1989 The Big Al Show 10,000 Maniacs Performed "Headstrong"
1989 The Arsenio Hall Show 10,000 Maniacs Performed "Eat For Two" and "Poison in the Well"
1989 The Tonight Show Starring Johnny Carson 10,000 Maniacs Guest Host: Jay Leno; performed "Trouble Me" and "Eat For Two"
1989 One Hour With Jonathan Ross Natalie Merchant Performed "Verdi Cries"
1990 The Word 10,000 Maniacs Performed "The Latin One"
1992 Saturday Night Live 10,000 Maniacs Aired October 31, 1992; performed "These Are Days" and "Candy Everybody Wants"
1992 The Tonight Show with Jay Leno 10,000 Maniacs Performed "These Are Days"
1992 Live with Regis and Kathie Lee 10,000 Maniacs Performed "How You've Grown"
1992/1993 MTV Drops the Ball 10,000 Maniacs Performed "These Are Days" and "Candy Everybody Wants"
1993 The Tonight Show with Jay Leno 10,000 Maniacs Performed "Candy Everybody Wants" and "How You've Grown"
1993 Late Night with David Letterman 10,000 Maniacs Performed "Stockton Gala Days"
1997 Showbiz Today 10,000 Maniacs Performed "Rainy Day", "Even With My Eyes Closed", "Big Star" and "More Than This"
1997 Live with Regis and Kathie Lee 10,000 Maniacs Performed "More Than This"
1997 Sabrina, the Teenage Witch (1996 TV series) 10,000 Maniacs Mimed "Rainy Day" on the episode "A River of Candy Corn Runs Through It"
1997 The RuPaul Show 10,000 Maniacs Performed "Rainy Day"
2014 Indy Style TV 10,000 Maniacs Performed "More Than This" and "These Are Days"
2015 WGN 9 News  10,000 Maniacs Performed "Canadee-I-O", "Lady Mary Ramsey" and "More Than This"
2015 Talk of the Town Mary Ramsey, Savannah King and Joey Molland Performed "Sweet Tuesday Morning"
2015 AM Buffalo John Lombardo and Mary Ramsey Performed "Canadee-I-O"
^ Deusner, Stephen (May 12, 2014). "Natalie Merchant: "When I talk to friends who have creative lives and children, we commiserate about all the time we wasted in our youth"". Salon. ^ Tobler, John (1992). NME Rock 'N' Roll Years (1st ed.). London: Reed International Books Ltd. p. 456. CN 5585. ^ 10,000 Maniacs, Our Time in Eden. allmusic.com. Retrieved 2013-05-08. ^ Hajari, Nisid (1995-07-21). "Naturally Merchant". EW.com. Retrieved 2011-10-02. ^ 10,000 Maniacs, MTV Unplugged. allmusic.com. Retrieved 2013-05-08. ^ Basham, David (2000-12-20). "10,000 Maniacs Guitarist Rob Buck Dies Of Liver Failure - Music, Celebrity, Artist News". MTV.com. Retrieved 2013-02-27. ^ "Cleopatra Records | 10,000 Maniacs Announce Official Release Date Of Their New Album And Offer A Sneak Peek!". Cleorecs.com. 2015-02-12. Retrieved 2016-03-13. ^ a b "Chart Stats - 10,000 Maniacs". allmusic.com. Retrieved 2012-01-23. ^ a b "Chart Stats - 10,000 Maniacs". theofficialcharts.com. Retrieved 2012-01-23. ^ a b c "Certified Awards Search". British Phonographic Industry. Retrieved on 2012-01-23. Note: User needs to enter "10000 MANIACS" in the "Search" field, "Artist" in the "Search by" field and click the "Go" button. Select "More info" next to the relevant entry to see full certification history. ^ a b c d "Gold & Platinum Search". Recording Industry Association of America. Retrieved on 2013-1-25. ^ a b "10.000 Maniacs: Music From The Motion Picture". ^ "10000 Maniacs Perform". Wish-Tv. 2014-07-31. Archived from the original on 2016-03-02. Retrieved 2016-03-13. ^ "Music Lounge: 10,000 Maniacs perform live". WGN-TV. 2015-02-13. Retrieved 2016-03-13. ^ Frank Pacella (2015-05-04). "10,000 Maniacs - Story". Wkbw.com. Archived from the original on 2016-03-04. Retrieved 2016-03-13. Wikimedia Commons has media related to 10,000 Maniacs.